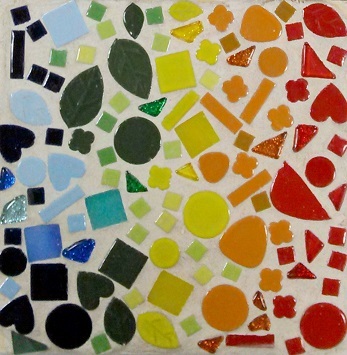 Learn to create mosaics by arranging colored pieces of stone, tile, mirror, and glass in a wooden frame. This class is perfect for the student who enjoys working with color, pattern, found objects, and three-dimensional creations. Students who enrolled in this class last summer are invited to continue their work with this inspiring art form this summer! Students who took Mosaics last summer will engage in new learning experiences, while discovering new challenges and approaches to art making in this class. Individualized attention, small classes, frequent gallery tours, and master teachers are hallmarks of the Michener Art Museum’s exceptional arts programs. Through exposure to a variety of art forms and art materials, all courses encourage the development of new skills and build confidence in creative expression. The Michener’s permanent collections balanced with changing exhibitions provide ongoing opportunities for looking at and learning about a variety of art forms in new ways. Students provide their own peanut free lunch for full day and snacks for half-day programs. Families and friends are welcome to come 15 minutes before the end of class every Friday to enjoy an exhibition of student work in the Education Gallery and classrooms.